The term Creole has had a number of meanings in the past several hundred years. The core of those meanings centers around the concept of New World products derived from Old World stock. The term today applies to those people of non-American ancestry who were born in Louisiana during its French and Spanish colonial periods and their descendants. From the colonial period on, there has been a significant Creole population in the state. Some Creoles are of French or Spanish descent, while others have a mixed heritage of African, French, Spanish and/or American Indian. When Louisiana became an American territory, the term Creole increasingly came to mean "native born" and was used to distinguish between the land's anciens habitants, or former colonial residents, and incoming Americans. Over time, the French language and the Catholic religion remained as identifying marks of many of Louisiana's Creoles. People sometimes confuse Louisiana's Creole population with French-speaking Acadians, today's Cajuns, who were exiled from Canada by the British and arrived in Louisiana years after the Creoles had established themselves there. Maison de Marie Thérèze sits on land granted to Marie Thérèse Coincoin, but the house may have been built after her death. Serving first as a French outpost and later as a Spanish one, Natchitoches was a crossroads for many cultural groups. Spanish and French soldiers, traders and farmers crossed paths with African slaves and American Indians on a daily basis. The beginnings of Creole Natchitoches lie with the descendants of these early colonial groups. As the area's earliest families, the Creoles of Natchitoches Parish had first choice of farmland and wisely settled in the rich Red River Valley, where the largest plantations flourished through the antebellum period. 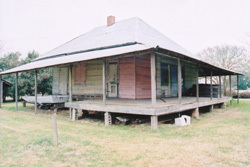 In southern Natchitoches Parish, the Creole descendants of Marie Thérèse Coincoin, an enslaved woman, and Claude Thomas Pierre Metoyer, a French soldier stationed at the Natchitoches Post, established the community of Isle Brevelle. Today's Cane River Creoles form the basis of the Isle Brevelle settlement, which has continued as a Creole community since its late 18th-century beginnings. Americans, who were latecomers to the area, tended to settle in the piney uplands away from the Creoles. Arriving with the English language, Protestant religion and a new form of representative government, Americans were foreign in almost every way to the Creoles of Natchitoches. Creoles maintained a dominant influence in local society despite the influx of Americans into the area. Anglo Americans were confounded with the multi-ethnic Creole people of Louisiana. A large portion of the population of color was free Creole; many, like their white Creole neighbors and relatives, owned slaves and large plantations, something rarely seen in the American states. Throughout Louisiana's colonial period, free Creoles of color had separate social status and occupied a middle position between whites and blacks in the colony. They enjoyed most of the rights of citizenship that whites did. Under the Americans, this separate status was threatened both legally and socially, for the American social system was two-tiered, with no middle slot between whites and blacks. Throughout the 1800s, laws increasingly limited the rights of free Creoles of color. At the end of the Civil War, Creoles of color found the greatest threat to their separate status in the emancipation of the slaves. Once all people of color were free, the American system established itself more firmly in Creole Louisiana, and the old three-tier social system began to give way. It was not until Jim Crow laws and the "one-drop rule" were enacted at the end of the 19th century that the separate status of Creoles of color disappeared altogether. Jim Crow laws governed racial segregation and defined black Americans as anyone having even "one drop" of African blood. In the minds of most Americans, Creoles of Color were categorized as black or mulatto, without any recognition of the separate cultural identity that they had long held. Similarly, white Creoles were absorbed into the great non-Creole white population and the Americanization of the old Creole social structure was very nearly complete. Many Creoles of color continued to call themselves French, maintaining a distinct cultural identity in spite of the American system that labeled them by color and not culture. Today, years after Jim Crow has ended, Creoles of color have been able to reclaim their cultural identity publicly, and there is a growing movement among them to promote a greater understanding of their heritage throughout Louisiana and beyond. Maintaining the traditions passed down to them, many Creoles today are found well beyond Louisiana's borders. As Creoles left Louisiana over the years they often followed family members to urban areas where they could find work. These family networks provided the beginnings of Creole colonies within larger cities. Today, metropolitan areas such as Houston, Chicago, Los Angeles, New York, and Las Vegas all have Creole sub-populations. 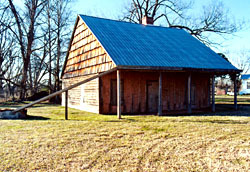 Although Creoles are found throughout the United States and the world, they often return to Louisiana, their "homeland." Their cultural heritage links them back to the state and to each other as descendants of the native-born of colonial Louisiana. Colonial Creole settlers used the material provided by the land to construct their buildings. Cypress wood, used in half-timbered framing, along with bousillage, a mixture of mud and binders such as moss, animal hair, or straw, was a characteristic feature of Creole buildings. 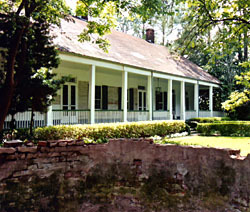 The earliest Creole structures tended to be of poteaux-en-terre (posts-in-the-ground) with poteaux-en-selles (post-on-sills) coming later. 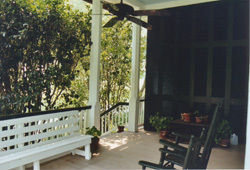 Larger Creole homes were raised West Indian style cottages with galleries (full-length porches that wrapped around a structure), separate exterior doors for rooms fronting the galleries and hipped or gabled roofs. Examples of all of these Creole architectural styles can still be found in the Cane River region. Homegrown vegetables and fruits, wild game, fish, breads and "extension foods" like gumbo and étouffée, combined with spices like red cayenne pepper and filé (dried, ground sassafras leaves), provide the basics of Creole cuisine. Traditional dishes include smoked bacon, ham and sausage in various forms: boudin (rice and sausage stuffed casings), andouille (smoked sausage) and zandouille (smoked sausage used as seasoning in other dishes). Tasso (smoked and dried strips of meat) reflects the American Indian practice of drying foods to preserve them. Revealing a strong Spanish influence, meatpies (crusts stuffed with ground beef, ground sausage and spices, reminiscent of empanadas) and tamales are also staple foods in a Creole home. Other fundamentals of a Creole diet are dirty rice (flavored with savory meats and spices), cornbread dressings, stuffed mirlitons (chayote squash), gratons (cracklings or fried pork skins), and boulets (meat balls made of seasoned ground beef served in a roux or tomato gravy). With the abundance of pecans in the area, popular Creole desserts include pralines, pecan pies and pecan cakes. Café has long been a traditional drink in Creole households, as have lemonade and iced tea. At the heart of every Creole community is the Catholic Church. In the case of Isle Brevelle, religious practices and church services were held as early as 1803, when the first church was established there by community patriarch Augustin Metoyer. 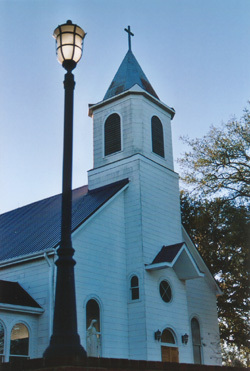 Significantly, St. Augustine Catholic Church at Isle Brevelle is the first Roman Catholic Church established by and for people of color in the United States, and it has served the Creole community continuously for 200 years. Generations of Metoyer's descendants have been baptized, married and buried there. It is where the community has gathered through the years, and it is where the community still joins together for dances, church fairs, First Communions, Toussaints (All Saints' Day) processions, midnight mass at Christmas and other community celebrations. Religious observances remain an important part of Creoles' everyday lives. For example, prie-Dieu (kneelers) and family shrines are traditional elements in a Creole home, as are rosaries, crucifixes, prayer cards and statues of patron saints. Throughout the antebellum period and beyond, Creoles farmed according to the ecclesiastical calendar-collecting sassafras on the Feast of Assumption (August 15), for example, or refusing to turn soil on Good Friday because of the belief the ground would bleed. Family feasts often followed mass on holy days, bringing together members of extended families for celebrations of both family and faith.